This year’s Arcadecon ticked a lot of boxes, with anime, gaming and sci-fi fans surely leaving satisfied. Cosplay enthusiasts in particular had a lot to get excited about, alongside top Californian copsplayer Missyeru being among the guests there were creative panels and workshops devoted to art of costume crafting and performance. As a clueless beginner keen to give cosplay a try I hoped that this would be a good opportunity to gather up as much inspiration as possible to kick myself into action. Arcadecon already has a substantial cosplay following, on Saturday 12th many of the visitors to the event were dressed up in their favourite characters for the afternoon’s masquerade competition, so there was plenty of ideas to take in between workshops. The first panel discussion of the day was Tendai Muzwidzwa’s discussion on racism and prejudice in the cosplay community. In some ways perhaps this was not the best panel to start on for confidence – as it’s intention was to raise awareness of a very real problem with negative attitudes towards cosplayers, particularly online. Tendai also discussed which techniques are appropriate when dressing up as a character from another race and her own perspective on handling attacks online if you don’t fit a trolls idea of what the ‘right’ skin tone or body shape is. Its sad to see that people can be forced into enjoying a hobby within boundaries that are bitterly set by some narrow minded people. So it was a pity there wasn’t more debate during the panel. Local guests Cian O’Siorain, Melissa O’Brien and Anatheill are notable local cosplayers who have each competed internationally. Together they made up the Creative Craft Cosplay Panel providing entertaining discussion about their own cosplay experiences and backgrounds. What made this a particularly worthwhile panel was that they each specialised in different techniques so there was a variety of practical advice from sewing to resin casting. Cian, a recent Ireland representative at EuroCosplay 2013 with his impressive Iron Man costume shared his methodical style of designing and developing armour prototypes. Anatheill started out buying costumes but quickly began constructing her own, teaching herself to sew and sculpt materials in the process and has since won a number of awards. Melissa (last years overall Eirtakon winner with her Steampunk Ice Queen) was very much the seamstress of the group, a costume designer and maker by trade. For people starting out, the panel had plenty of tips on the best materials to use for body armour, dresses and accessories, the treachery of hot glue and the quality of tutorials you can now find on youtube. Each with experience in competitive cosplay the panel discussed taking part and the judging process involved at conventions. Stitching, colour, craftsmanship and how you play the character on stage are all scrutinised so the rewards really come to those with attention to detail. Of course none of the panel were born experts and each panellist was happy to chat about some of their last minute costume malfunctions and hefty investments in materials that didn’t work out. However all agreed that even though ultimately you may spend 28 hours or more for 3 seconds of fame, the fun you have and the skills you learn make it worth it. Later that day Cian held an armour planning and construction workshop which I sadly missed but I am guessing it was more than likely awesome. However I did make it to Ana’s warbla demonstration. Warbla can be potentially a cosplayer’s best friend, for anyone who may not have come across it before it’s a seemingly almost miracle material for numerous uses that once heated can be fairly easily shaped and fused. Ana had samples and interactive demonstrations alongside some of her own brilliant finished products. During the rest of Arcadecon Ana could be found at her stall; being possibly the only worbla merchant in Ireland we made sure to pick up a starter roll for ourselves from her before we set off for home. After the masquerade were all those who’d dressed up got their moment on stage (the main hall of Ballsbridge Hotel was a full house), costume designer turned renowned cosplayer Missyeru led the special guest panel. Down to earth but knowledgeable fans had a chance to ask her about her 10 years of experience on the cosplay circuit. A gamer at heart (her League of Legends costume tally is now 15! ), her passions are really reflected in the detailed costumes she makes. This extends to her research methods and techniques. Indeed her own advice for new starts was to always pick a costume of a character that you love because you will be staring at it for weeks and have to stay passionate or you’ll never get it finished. Like the Creative Cosplay trio, she’s had her fair share of costume disasters just before cons and at airports that has brought well needed support at such times from friends and her mum (despite her parents being as she puts it ‘super jocks’). Missyeru was good choice of guest in that she’s not just a cosplayer, she’s a massive nerd and she talked about topics ranging from her favourite video games to Disney characters (was great to see another who holds the original 150 Pokémon so close to her heart!). Missyeru suggested Danerys, Shiva from FFX and the Flash for potential future costumes she’d love to make – so her fans have much to look forward to. It was interesting to see so many perspectives and personal experiences of being cosplayer. I’ve learned all it demands commitment and enthusiasm so the skills and techniques should develop themselves. For the most part it’s a good way to meet new people, sure there will be assholes – it can just take one comment to ruin your day. However the general consensus is, (as most nastiness tends to happen online) not to read the comments and have fun! Easier said than done but I guess it’s a skill in itself and part of the learning curve. 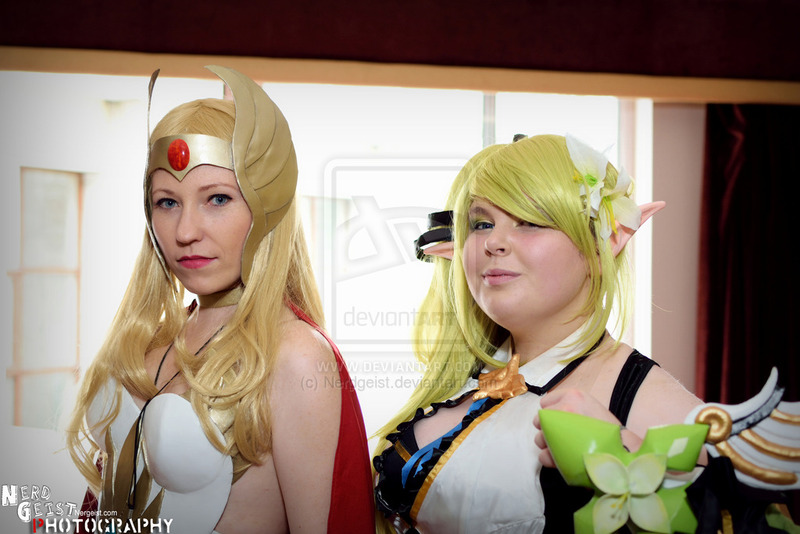 Arcadecon brought out the best side of being a Cosplayer, with an atmosphere willing to share ideas and have fun this is a great stop for anyone looking for inspiration.The con attracts quality guests and there’s plenty of space and function rooms for inventive workshops. All in all we left the con genuinely better equipped and finally just enough confidence to try it for ourselves.